Abstract Body: Age-related declines in neural function result in part from alterations in synapses. Unfortunately, very little is known about the molecular pathways that underlie these changes in part because most age-related synaptic alterations are subtle and difficult to quantify, owing to the small size of the synapses and the complexity of brain circuitry. We therefore focused on a large, easily-visualized synapse in the outer retina that undergoes dramatic alterations in old mice and humans. In old retina, numerous ectopic synapses develop in the photoreceptor layer along aberrant processes arising from horizontal and bipolar cell neurons. We show that defects in the LKB1 and AMPK energy regulatory pathway underlie these alterations. In old animals, synaptic remodeling is accompanied by specific decreases in the levels of both LKB1 and active AMPK (phosphoT172-AMPK), while the levels and phosphorylation state of other LKB1 targets are unaffected. In the absence of either LKB1 or AMPK, young mice develop retinal defects similar to those that occur in old wild type animals. 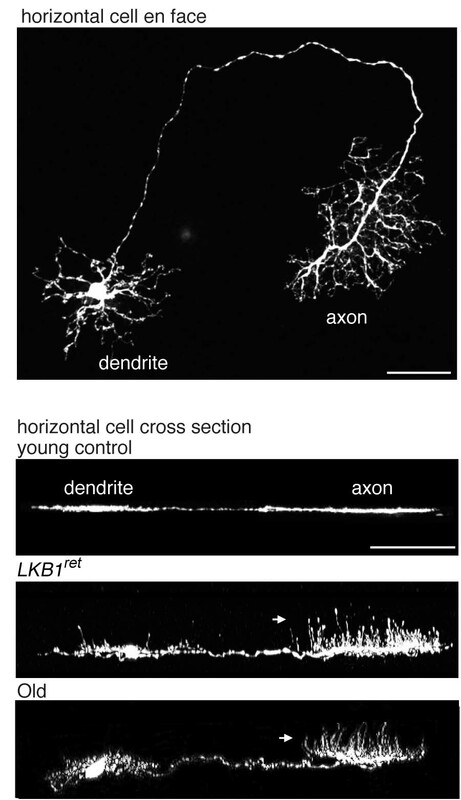 Using conditional alleles, we examined the cellular basis of this remodeling and show that LKB1 and AMPK function specifically in photoreceptors to directly modulate rod axon localization. Moreover, restoring AMPK genetically in either old or LKB1-deficient animals rescues the synaptic alterations. Pharmacological (metformin) or dietary (caloric restriction) interventions that increase AMPK activity also attenuate age-related synaptic changes. Conversely, alterations are exacerbated in mice fed a high-fat diet. Together, these results identify a molecular cause of age-related synaptic remodeling and suggest that energy homeostasis pathways play a critical role in preserving neural function in old age. Lay Language Summary: Along with wisdom, age brings many unpleasant alterations in neural function: for example, memory declines, reflexes and mobility deteriorate, and our senses, such as vision and hearing, are blunted. Moreover, age is the major risk factor for numerous neurodegenerative diseases. The functional changes themselves have been extensively described, and many appear to result from alterations in synapses. However, molecular mechanisms that underlie these age-related changes remain largely unknown. Discovering these mechanisms could lead to strategies for slowing age related neural decline and treating neurodegeneration. Here, we focused on the first synapses in the visual system, made by rod and cone photoreceptors in the retina on to interneurons, which process the visual signals before they are passed on to the brain. These synapses are especially large and accessible to study, and they have been shown to undergo dramatic structural alterations in old mice and humans. We used this system to test roles of a pathway involving two enzymes (kinases) called LKB1 and AMPK. This pathway has been implicated in control of both neural development and energy metabolism in mammals, and regulates life-span in invertebrates, making it a good candidate mediator of synaptic aging. We show that activity of LKB1 and AMPK decreases in the retinas of old mice. Deleting either of these genes in young animals results in accelerated synaptic aging. Alterations are evident even when the genes are deleted only from rod photoreceptors, indicating that these cells are drivers of synaptic change. High-resolution imaging shows that loss of LKB1 or AMPK causes photoreceptor terminals to retract, which in turn causes the processes of postsynaptic interneurons to sprout and form ectopic synapses (image 1, arrows). Conversely, activating this signaling pathway genetically or pharmacologically, suppresses photoreceptor retraction and postsynaptic sprouting in old animals. Likewise, caloric restriction, which blunts age-related decrease in AMPK activity, markedly slows age-related synaptic disruption. Together, these results identify a molecular determinant of age-related synaptic remodeling and demonstrate means by which the remodeling can be slowed and possibly reversed.